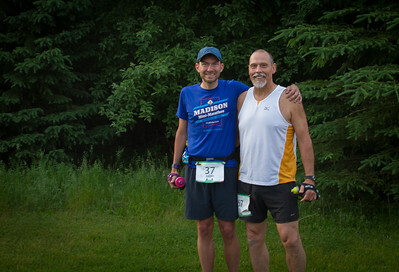 On June 3 & 4 Brian Mansky and RJ Miller competed in the Kettle Moraine 100 Mile Ultra. This is RJ's story. It is written with the hopes that it will help others in their quest to achieve what may seem impossible. 14 Miles… it seemed so close. On a normal day it should only take 2 hours and 20 minutes to run. Today it would have been optimistic to think I could cover that distance in 6 hours. Later looking at the map it was only ½ inch of terrain. I stared at that map and traced my finger over what I covered and I think, I only needed a ½ inch but, but at that point in my race those 14 miles may have been a trip to the moon. 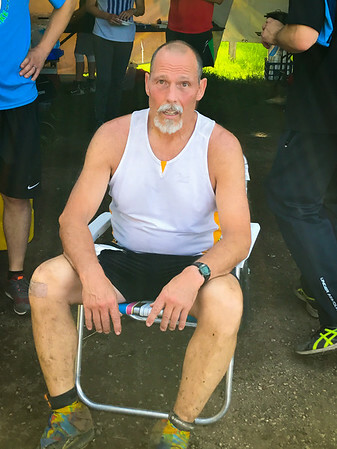 The cut off time was 26 ½ hours and I wouldn't make it, and even if I had, it wouldn’t have been fair to make the aid station volunteers wait another 6 hours for me to limp from the woods? No I couldn't do that, but it didn’t matter, I didn't make the cut off time. Gimping to the 86 mile timing mat, my friends and volunteers clapped and I accepted their generous accolades. 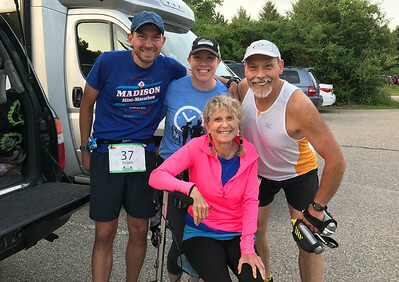 I took pictures with friends and family who had generously given up their weekend to help me get to the finish line… but it wasn't the finish line and I felt the weight of their sympathy. Surprisingly, I wasn't disappointed with myself. I have been in the past. But not this time…. We gathered at the start line and I wished my friend Brian a good race, we took a few pictures, and laughingly comparing the size of our calves and clean shoes Then a last minute hug before he headed to the front of the pack and I positioned myself towards the back. The “three, two, one, go!” start seemed a little anticlimactic in comparison to the work we put in to get to this point… but we were moving… like most races the nervous jokes and banter are followed by a quiet silence as we all settled into our thought and the magnitude of the goals we had set. The first few miles of rollercoaster hills I kept hearing water falling and it took a while to realize it was the sound of running shoes on loose rocks. Other than that it was surprisingly quiet considering the pack of runners surrounding me. I suppose they were all lost in thoughts of “am I ready for this” maybe second thoughts of “I didn't train well enough.” Those thoughts didn't concern me… mine were focused on the weather. I knew I was ready. I trained hard. I spent hours planning the race… I just needed to adjust for the heat and humidity. My first adjustment was to pick up my pace to try and cover as many miles as possible before the sun burned off the clouds. We were all walking the uphills, but some of the more gentle inclines should be run and I found myself getting slightly irritated at the pack for not pushing a little harder on those. Eventually we spread out a bit and I was able to hold a more consistent pace until Bluff Aid Station. After a quick water refill we set off towards the overlook that is the highest point on the course. A long steady slow march up the switchbacks was rewarded with a very brief view of a scenic overlook… a quick glance then back into the woods for a nice downhill run to Ema Carlin aid station and the first meet with my crew… My wife Linda and our friend Liz, whose husband Brian was on the course well ahead of me. I was very grateful for Liz's helping Linda get around. Linda was injured with a leg injury and was restricted to using a knee cart. At Ema Carlin I recorded a message to a running friend of ours who has a reputation for hard falls .. “Laurie there are a million opportunities to throw yourself on the ground here.” This was in reference to a couple of falls I had already witnessed and there were many runners smeared with dirt and mud from falls I didn't see. Ema Carlin was to be the first of my planned stops and it went quick and smooth, in and out in less than 5 minutes, fully fueled and hydrated. One of the improvements I made over previous long endurance runs was put to its first test at that aid station. 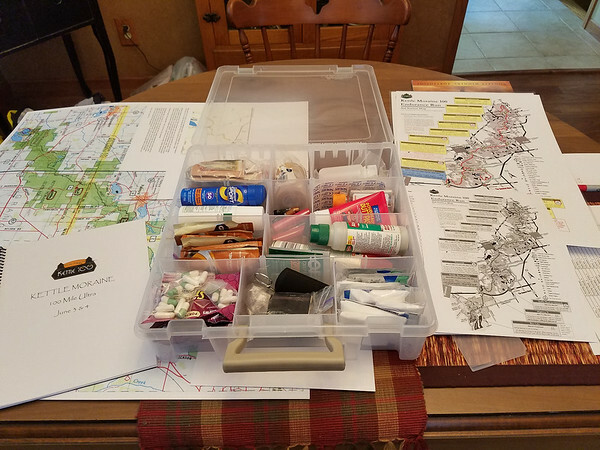 I had read about runners who use a “kit”, which is nothing more than a container to hold most of the things a runner will need during a LONG endurance race. I searched through many types of tackle boxes, but none of them had the right sized cubicles. Until I happened to be in a craft store and found the ideal container. 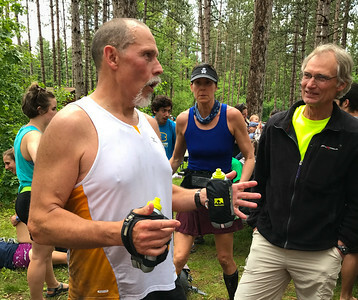 So, when I ran into the aid stations, my crew had it ready and I just reached in and grabbed what I needed to replenish the pouches on my water bottles. It was quick and very efficient. The meadow laid ahead of me… blogs had warned of this section being warm and totally exposed, it worried me, I don't do well in heat. Calling it a meadow may have been the biggest joke of the day. For some reason I had a “Sound of Music” meadow image in my head… the reality was far, far different. The heavy cloud cover choose the moment I entered the clearing to release a heavy thunderstorm. I was grateful for the clouds until lightning lit the sky accompanied by loud booms of thunder. It wasn’t the first storm Kettle Moraine had seen. The trail was a mud pit… a shoe sucking, slippery, stinky swamp of a trail. Traction was difficult at best and our pace slowed to a crawl. At least the sun was hidden behind the clouds and I remember telling a fellow runner “if that sun comes out, with this humidity we are dead”. Highway 67 aid station was a welcome site. 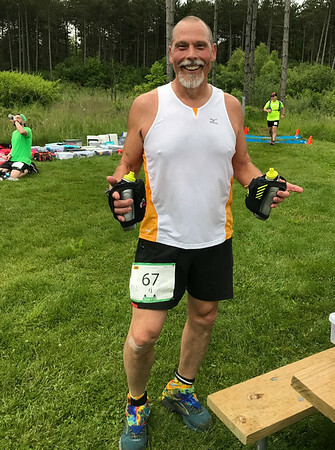 My crew had gone ahead to support Brian at Scuppernong so I loaded up with their pb&j, chips and some Mountain Dew, quite pleased that I was back on course in just a few minutes. The calories carried me the next 3 miles. 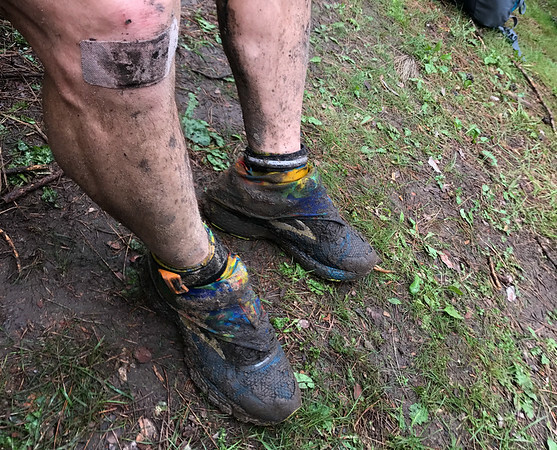 Arriving at ZZ - the relief was overwhelming… I was through the first meadow crossing and in spite of slogging the last 8 miles through ankle to sometimes shin deep mud I was still moving pretty well. Having just eaten there was no need to stop except to top off my water, so I ran on, really excited to be nearing the turnaround at Scuppernong. My joy was short lived. The turnaround was “only” 5 miles away. That 5 miles was brutal. It started immediately after ZZ. The recent rains had turned the rocky steep trail into a seriously dangerous hazard. We found ourselves crawling the slippery uphills hoping for trees to grab and pull ourselves up. For every two steps we slid back one. As we crested the hills we tried to slowly slide down the muddy slopes on the other side. One particularly steep muddy slope I watched a runner lose his balance and skate/slide 40 or 50 feet to the bottom. How he never fell was amazing, and the rest of us prayed for similar balance and luck. Surprisingly I never fell on those nasty slopes, but body prints in the mud told of others who weren't so lucky. Coming around a bend I ran into my running friend Brian returning from Scuppernong. He assured me the trail was easier ahead and he was right. Rounding a bend the trail leveled and entered a beautiful forest of pines. The pine needles underfoot were a welcome respite to the nasty grind I had just slid, crawled and stumbled through. As I neared the turnaround returning runners warned that the 50k runners were lining up to start. In the distance I heard a loud cheer and a few moments later they flew past and I thought “ wait till they get to those slip and slide slopes, filled with sharp rocks… they won't be quite so enthusiastic. 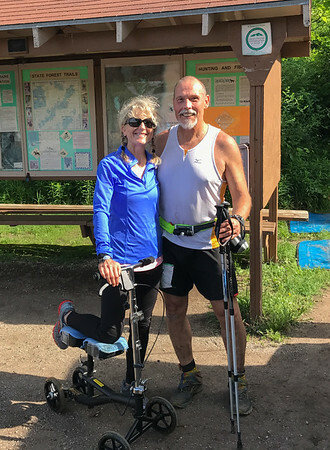 Finally, I entered the Scuppernong aid station and found Linda and Liz waiting for me with the kit, a slice of pizza and my standby; flat mountain Dew. They had been waiting with John Blanchar and David Schmidt, there to crew Jim Stenulson and Rob Smith. All 4 were friends from La Crosse. 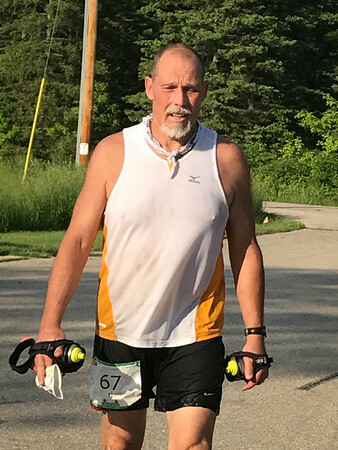 I had been encouraged by them at the last couple of aid stations and expressed that I was struggling with the heat and humidity. Experienced ultra runners themselves they insisted that I tie Dave's ice filled bandana around my neck to help me cool down. My respect for John and David grew immensely throughout the next 24 hours and I felt honored to have been the beneficiary of all their help. I left the aid station concerned about the return run through the muddy slip and slide. Surprisingly, the 50k runners had tracked up the slimy hills and traction was improving. The rain had stopped and the sun was filtering through the forest canopy, slightly drying the trail. Happily I got back to the ZZ aid station without a fall. The sun’s return meant a rise in temperature and the recent rain was making it steamy. Concerns about recrossing the meadow were valid. The storm clouds were gone, ALL clouds were gone, the humidity was not. The shin deep muddy trail was worse… hundreds of runners had churned the soft mud into shoe sucking, stinking, puddles of ooze. Other runners were trying their best to run, I was content to power walk to keep my core temperature as cool as possible. I had crossed a clear water stream on the way out and my focus was to make it to that stream. It became an obsession, it was all I could think about. At last I came to the small bridge over the “mountain” stream. I quickly lowered myself into its icy waters, not believing how cold it was… I submerged myself until I was numb. Later I found out that stream is called “Paradise Spring Creek”. That afternoon it was Paradise to me. Sadly it's benefits didn't last nearly long enough. Forty minutes later I came to Stute Spring Creek, another crystal clear stream that I didn't remember crossing. I plunged into its frigid waters too. A few more minutes on the trail and I trudged into the Emma Carlin aid station at mile 47 to a wonderful surprise. My crew had grown. 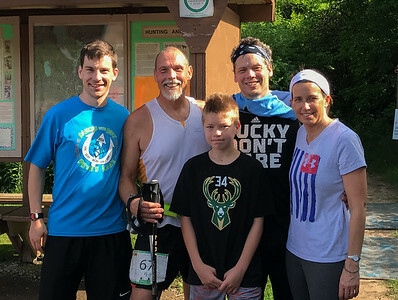 Unexpectedly my brother Matt, his wife Jill and their 12 year old son Kodi were waiting along with my good friend and soon to be pacer Ben. Linda, Liz, John and David were waiting there as well. It felt like an emergency room, as they performed triage. They refilled my bandana with ice, filled empty water bottles, fed me my Hawaiian pizza, handed me a cold mountain dew, helped me change socks, and handed me my hiking sticks. When asked how it was going so far my dismal reply was “That meadow burned a hole in my soul”. It was here that I made my only true mistake of the race. In my exhausted state, I didn't really think I needed my light yet, but my crew disagreed until I relented and said “OK”. However, in my haste to always keep my stops to just a few minutes I took off for Bluff Aid Station without it. An oversight that I didn't realize until I was 10 minutes down the trail. I decided to worry about the light later, for the moment I felt joy and elation from the encouragement and help of my crew. Stepping up the pace was easier with the help of my sticks and a much drier trail. The trail is uphill to the top of Bald Bluff Scenic Overlook. My concern about the rapidly dwindling light was growing and I made a concerted effort to stay close to a couple of runners ahead of me. My plan was to run on their heals using the glow of their lights to make it to Bluff. Reaching the top of Bald Bluff was amazing as the sun was setting and lighting up the hillside in a beautiful glow. Not able to just sit and enjoy the dwindling light was a bit of a bummer, but I couldn't afford to lose anymore daylight. Still close to the two runners ahead of me, we powered down the hill into Bluff Aid Station. I started wondering if they didn't have lights either as all three of us rushed into the aid station just as the trail was sinking into darkness. My crew was set up in the glow of the aid station. As I flopped into a waiting chair they sprung into action, filling bottles, stuffing pizza and Mountain Dew into my hand that went quickly to my mouth. Always one of them had my kit ready for me to grab anything I might need. Unbeknownst to me they had set up a pacer schedule, so after keeping to my “brief stop” rule I set off toward Nordic with my first ever pacer, my brother's wife Jill. This was a new experience for her… running/hiking in the dark. Our pace was a power walk over the next seven miles of rocky rolling hills. None of those were huge, but the continual up and down was taking its toll. It's always amazing how we meet people on the trail who have run the same races we have. Jill and I met Katie. 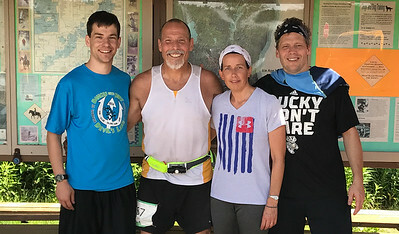 As we powered over the hills we found out we live 600 miles apart yet have some of the same running friends and that we were both signed up for Goosebumps ( a 24 hour run) held in September on the banks of the Mississippi River. Miles flew by as we shared stories of runs and friends. Katie got a second wind and we parted with “See you at Goosebumps”. Earlier we had ran through swamp and rain. We traded that for wading through grass heavy with wet dew. The humidity was still very high and other than an occasional puff, no breeze or cool down was to be found. We found ourselves in a mix of 100 mile runners and 100k runners. Many of them were in a world of hurt. One woman’s soft cry will haunt me forever. She was signed up for the 100 mile, but all she wanted to do was make it to 100k at the Nordic Aid Station. A few minutes later we came upon 3 more runners, one of them was severely sick and violently launching her cookies to the side of the trail. Normally in that situation I would stop to help, but she had help and was nearly done, I still had 40 miles to go. Rolling into Nordic at 63 miles, my thoughts were only on getting in and out as quickly as possible. Warnings of “beware the chair” rang in my head, thoughts of stopping never crossed my mind, but I was acutely aware of how quickly one can stiffen, cramp and mentally breakdown. After just seeing runners already at that point it reinforced my panic to get moving again. I thanked Jill for pacing me and went through triage again. I was handed a Dew and a piece of pizza. My “kit” was held out for me to decide if I needed anything, so I restocked my water bottle pockets with electrolyte salts, chews and Gus and changed socks. Earlier I mentioned my 12 year old crew member Kodi. He had unselfishly taken on the responsibility of filling my water bottles with ice and water. 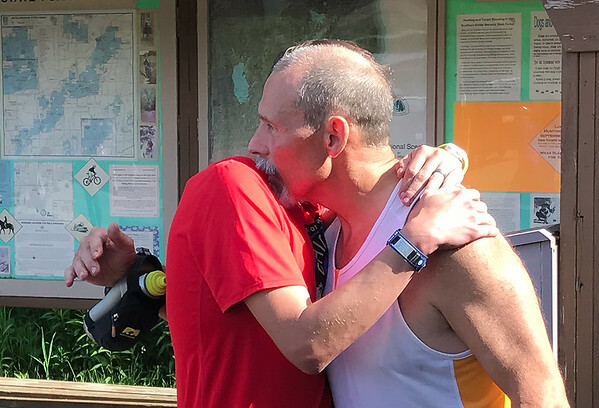 But, at this aid station he did something I shall never forget and it made my efforts worth every moment… he rubbed my neck and shoulders. While this may not seem like anything out of the ordinary, I thought “what 12 year old boy would do that for his uncle?” For me, at that moment, it meant everything. I carried that memory throughout the rest of my race and will cherish it always. Ready to go, my crew had arranged for my good friend Ben to pace the next section (to highway 12 aid station). We left nordic aid station with a shout “ number 67 going back out”, which raised a cheer from the crowd gathered there. I thought to myself, one way or another, the next time I saw Nordic I would be done. 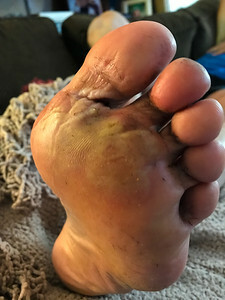 I had hoped to start running again, but my feet were trashed and the heat and humidity were still taking its toll. So, we power walked. The humidity thickened the night air into a misty fog. My waist light was playing tricks on me and I felt a little queasy. Maybe it was my light dancing off the fog, but it was probably a little dehydration combined with vertigo... I wasn’t feeling well at all. I told Ben I needed to lay down. So I did, right in the middle of the trail, telling him no more than 3 minutes. Two and a half minutes later I was up and ready to go, still not quite sure what the problem was, but feeling slightly better. Ben was so valuable and patient over the next few hours. He reminded me to take my Gus, keep on drinking, kept me on the right path (even though there were times when it seemed like hours since the last flag) and most appreciated of all… he encouraged me. We talked some, but mostly we just plodded along as fast as my aching feet and overheated body would go. He knew how bad I wanted this goal, he knew I would give it everything I had, so he didn't hound me, and I was grateful for that. We made a short stop at Tamarack Aid Station where kind volunteers served fresh soup. Surprisingly, in spite of the heat the salty chicken noodle soup hit the spot and I felt a lift in my spirits from the food and the wonderful aid station crew that shared the night with us. We were back at confusion corner and very grateful for the race organizers who made it easy to follow the signs and light sticks. It started to rain a little and with it came a slight breeze… a very welcome breeze… it lasted about a minute and blew off to cool someone else, leaving behind the sticky humidity that was wearing on my cooked body. The next seven miles were a blur and slightly disorienting. In the weeks leading up to the race I had multiple nightmares and in each I was in an endurance race and I was off trail and lost. So, not surprisingly I was more than a little paranoid about getting lost. Again and again I kept harassing Ben, “have you seen a flag lately?”. His constant reply of yes was reassuring, yet I still worried. 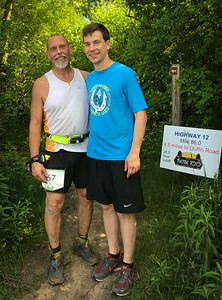 We ran into Brian and his newly recruited pacer David heading back toward the finish line from Rice Lake. We hugged and congratulated each other for making it this far. The next time I saw Brian he was a Hundred Mile KM finisher. I mentioned earlier how this section of trail was a little disorienting and part of that was because there were far fewer runners on the course and the ones we did see were mostly dancing lights in the darkness. From that darkness a most wonderful thing began to happen… The sky began to lighten. Birds began to sing, my heart sang. I wasn't even sure where I was, but we passed a couple of ponds and it's frogs were croaking and the birds and frogs put on a symphony of nature's best. A final climb and I limped into highway 12 aid station at mile 77.1 still moving as best I could in spite of very sore feet. 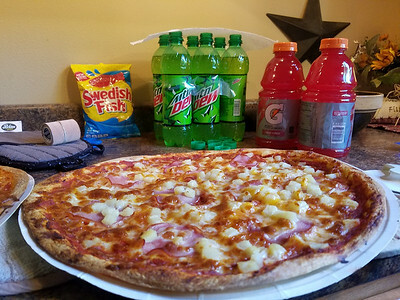 My crew was waiting with my kit, more pizza and dew. My crew had arranged to have Ben wait at Hwy 12 so he and I could finish at Nordic together. First I had to get to Rice Lake and back. My brother Matt was ready to pace me as soon as I had polished off my pizza. Even this far into the race I was able to keep my aid station visits to less than five minutes. I grabbed my water bottles, walking sticks and off we went across Hwy 12. I was grateful for the walking sticks as that section of trail was steep with lots of rocks and switchbacks. I'd never carried two hand bottles for over 24 hours before and those combined with the walking sticks were starting to develop blisters. 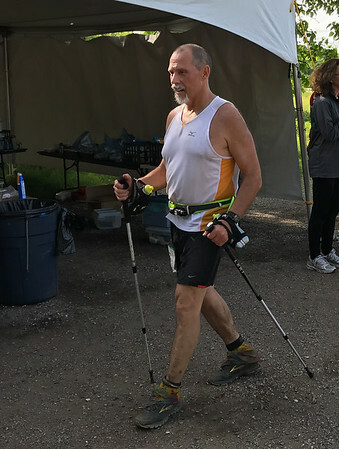 So, instead of strapping the bottles to my hands I slid them down to my wrists, where they awkwardly rode the rest of the race, leaving my hands free to grip the walking sticks a little tighter. Without a doubt those sticks kept me from major injury as I stumbled and tripped on many of the rocky obstacles. They were also a tremendous aid on the downhills, taking some of the stress off my blistered feet. I felt bad as some of those painful steps forced an involuntary moan through my gritted teeth. I'd heard a rumor that the trail into Rice Lake was easier and beautiful, I was looking for both, but except for a 100 yard flat stretch through a beautiful pine forest, easier was not there. Matt was patient as I tried to navigate the steep downhills. The sun had come out again and with it climbing temperatures. I felt like a slug trying to cross a vast stretch of pavement as the heat and humidity sucked the last bit of energy from my abused body. At last we crossed the wooden bridge and stumbled into the Rice Lake and station. 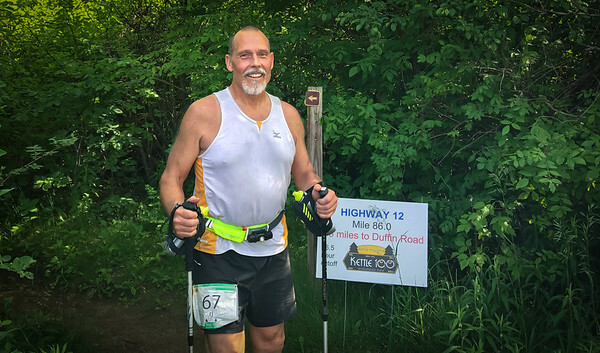 I'd been calculating my pace and cutoff times for hours and knew that it was very unlikely that I would make the Hwy 12 cut off, but I also knew I would not quit until the race monitors told me I was done. So, after a brief stop and wonderful help from the aid station volunteers it was time to get going. I was a little shocked when the volunteers expressed their surprise that I was going to keep going. A couple miles down the trail we caught up to another runner who was limping badly. I tried to encourage him, but he just mumbled “if you hurry you can make the cut off”. 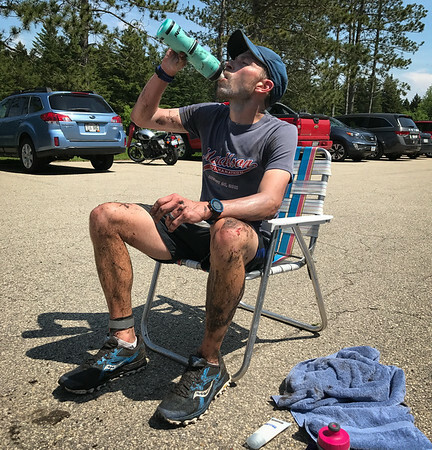 I shared my belief that it wasn't fair to make the aid station volunteers wait when I knew I could not make it back to Nordic by the 27 hour cutoff. In fact, at that moment Nordic seemed as far away as the moon. There were an amazing amount of switchbacks between Rice Lake and Hwy 12 and just when I thought I recognized the last downhill to the road the trail would turn and head back uphill. The trail was rough and the sharp rocks were causing a considerable amount of pain in my blistered feet. The sounds of cars on highway 12 were close, then finally to my great relief we were leaving the forest with the aid station just across the road. My race was done. Surprisingly, I wasn't disappointed with myself. I have been in the past. But not this time…. I was 15 minutes past the cut off time. My crew and 100 mile finisher Brian were there waiting for me. The looks of sympathy on their faces said it all. The race director was there to break it to me gently, but I already knew. I was relieved… I was happy. My only regret of the race was not getting to finish with my pacer Ben. I would have so enjoyed that. Ben, always kind and compassionate, congratulated me and tried to hide his disappointment from me, but I knew he wanted to finish it as well. From the aid station we DROVE to Nordic to clean up and pick up my 100k buckle. My crew teased me about running the “extra” 24 miles. It was here that I experienced another once in a lifetime memory. If you remember, earlier I had been helped by John Blanchar, the runner who had over 100 marathons and 100 ultras under his belt. He congratulated me on my race and then helped me get to a hose to clean up my muddy legs and feet. Without a moment's hesitation he took a bucket and sponge and proceeded to gently wash my beat up feet. This sacrificial help gained him more respect from me than any race accomplishments he may have... what an example of servant leadership. It is easy to see why he is so respected among his fellow runners. Thank you John. I was beat up, sore, overheated and tired, but not disappointed. I had run a nearly perfect race. I ran within my abilities. The list of achievements overwhelmed the wall of failure. I had gained immeasurable experience. I gave it all I had. I have memories that will last a lifetime. I could not have asked for more. Running with a full crew was a new experience and words are inadequate to describe what having a reliable team means. I never worried. At each aid station they were there, ready with kit and cooler to supply whatever was needed. It is a thankless job… hours of waiting to spend 4 to 5 minutes to help a stinky, exhausted, old man try to attain a life goal. What a sacrifice… and thankful doesn't begin to describe the gratitude I feel.